ASUS InstantOn is a small, official application that allows you to resume using your computer quickly after it's been put in stand-by mode. 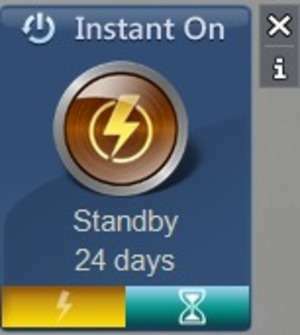 Using ASUS InstantOn takes around 2 seconds to go from a power-off state to resuming using Windows. The technology by ASUS claims to allow for up to 2 weeks of standby status by using a low-power mode. If power is less than 5%, InstantOn will automatically store the data of the current session on the system solid state drive (SSD). Version 3.0.6 is a freeware program which does not have restrictions and it's free so it doesn't cost anything. For security reasons, you should also check out the ASUS InstantOn download at LO4D.com which includes virus and malware tests. Additional screenshots of this application download may be available, too.